Mayor Emanuel’s flash school-closing announcement is meeting civil disobeidence from Chicago teachers—who are having no trouble poking gaping holes in every one of the city’s arguments. One thousand Chicago Public School teachers and their supporters, including this correspondent, packed Daley Plaza in forty-degree temperatures on Wednesday for a rally protesting the city’s announced plans to close 54 kindergarten-through-eighth-grade schools next year. One-tenth of the protesters were detained and ticketed (though police originally said they had been “arrested”) at a sit-in in front of school board headquarters a few blocks to the south. What they are protesting is genuine shock-doctrine stuff—an announcement utterly rewiring a major urban institution via public rationales swaddled in utter bad faith, handed down in a blinding flash, absent any reasonable due process. Though Mayor Emanuel is learning that the forces of grassroots democracy can shock back too. And boy, does he have it coming. The story went down like this. Immediately following Mayor Rahm Emanuel’s defeat in the historic Chicago Teachers Union strike this past fall, the district, claiming massive underutilization of school facilities in light of an announced $1 billion budget deficit, began talking about closing perhaps 129 schools. The district CEO Jean-Claude Brizard—sacked soon after as a “distraction” to “school reform”—had once said he could only imagine closing perhaps three schools, given the paucity of schools performing better than the ones they would have shut down. Knowledgeable observers thought perhaps a dozen or two would end up getting the axe. (You can hear those details in this panel discussion from February of this year). It took a petition signed by an overwhelming majority of the city’s fifty alderman to even win hearings on the issue. But those hearings were a disaster—“cannibalism,” as one alderman described them, “Good people pitted against each other because each one was trying to save their individual school.” A war of all against all: just the kind of atomization any self-respecting shock doctrineer wants to see among his constituency. Karen Lewis, the Chicago Teachers Union president, called them a “sham” for all the effect she thinks they actually had on decision-making. Why is this a matter of conscience? Isn’t it reasonable to assume that declining enrollment figures mean some schools should close? Some schools, perhaps—but consider this school-closing plan in its sordid specifics. When Rahm finally showed his face, sunburned from the ski trip, for a Saturday press conference (to brag about the opening of a new Walmart), he admitted, “there is a lot of anguish and I understand that and appreciate it.… But the anguish and the pain…pales compared to the anguish that comes by trapping children in schools that are not succeeding.” Which makes no sense, when you consider that many of the schools receiving new students perform at or below the levels of the schools that are being closed. One of those closing schools is called George Manierre Elementary. Located within the boundaries of the former Cabrini-Green housing project, its students are to be sent to another Cabrini-Green school seven blocks away, Jenner Elementary, that has lower test scores. So Rahm is lying; no surprise. Here’s another issue of which the city has proven shockingly heedless: community. There is more to maximizing the utility of limited educational resources than measuring the capacity of school buildings and discerning whether they are 50, 75, or 100 percent full. There is also the fact that each school is an individual human institution, with its own human ecology. Keeping that community together—or at least thinking about whether each individual school is working or not working qua community—has value in itself: for the students, for the teachers (God forbid we think about their human needs), and for the larger community within which the school operates. When you close a school, you kill something: a network of trust (or distrust), a web of relationships (which might or might not be functional relationships), an environment. It is in this way that, when you listen to and read the coverage here, the school-closers and the would-be school savers talk past each other. You hear parents, teachers, and students literally moved to tears at the thought of the places they love closing. Then you hear the CPS people talking statistics. Stunning, stunning, stunning: As even the district’s official school closing documents acknowledge, the number “145,000” refers to the number of Chicagoans between the ages of 0 and 19 the city has lost, a large number of which are not even school age, many of those who are school-aged not being CPS students. So Apples to Apples ran the numbers of students CPS has actually lost: only about 30,000, about a fifth of their mendacious claim. It’s enough to make an honest person want to scream. “Everybody on the board did not look at this decision as numbers on a spreadsheet,” said Rahm at his sunburned Saturday press conference. “We looked at it and viewed it as what can we do to have every child have a high-quality education regardless of their neighborhood, regardless of their circumstances, regardless of where they live.” Yeah, right. There is a reasonable suspicion that a lot of these shuttered schools are going to be turned over to charter operators. In 2012, belying every “underutilization” claim, the school board announced plans to open 100 new charter, “turnaround” and “contract” schools over the next five years. Considering that fact, here are some other accurate statistics concerning the United Neighborhood Organization, or UNO, the city’s most prominent charter company, whose CEO, Juan Rangel, is a major supporter of Mayor Emanuel. $1.5 million: the amount a company owned by the brother of a top UNO executive, Miguel d’Escoto, got for work as the “owner’s representative” for UNO school construction. $10 million: the amount another d’Escoto brother stands to make installing windows in UNO schools. $98 million: the amount of the state grant to UNO for school construction from which this beneficence derives. You see why Chicago teachers are angry. And why they’re not going away. And why they promise more civil disobedience. “So lemme tell you what you’re gonna do,” shouted Karen Lewis at the rally. “On the first day of school, you show up at your real school! You show up at your real school! Don’t let these people take your schools.” They just might. They’ve beat Rahm before. They could beat him again. 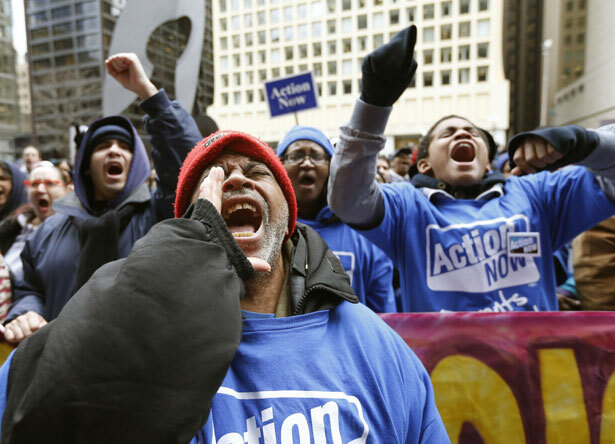 For more on the uproar over education, read Allison Kilkenny on Chicago teachers’ tactics.